The narrative element in Jo McAllister's work emerged again in 2011 when she was involved in 'Rooms for ideas', an exhibition based on the random allocation of a room in a museum. The Wildlife Room was full of the dark, dusty and dead. McAllister felt compelled to explore the nearby landscapes from which the inanimate creatures had originated. She found herself walking, taking photographs and immersing herself in the sense of places in and around Hastings, sometimes accompanied by her son and her relationship to these landscapes necessarily changed. Spaces for quiet observation became, in his presence, the hunting ground for conkers, feathers and bugs, and the scene of catapult and sword fights. A theme emerged: jewellery and objects for observation, collection and enjoyment. 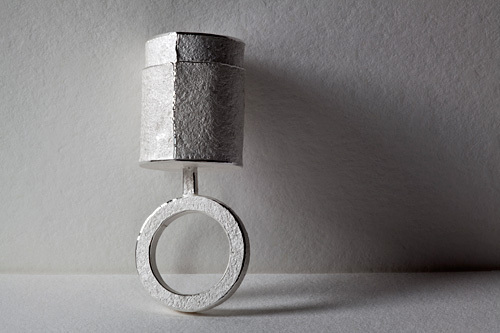 The collection of metaphysical jewellery and objects produced has fed back into her studio practice, thus the narrative has proved both a conduit for ideas and a platform for reflection. Lidded containers for petals, leaves, feathers and more became Collector's Rings. These pieces can all be purchased or commissioned. Contact Jo for more details.